Planning is a delicate process of balancing family dynamics, tax laws and business sustainability which demands technical expertise along with careful thought and wisdom. Wade knows how to strategically structure, negotiate and document the planning transactions his clients need to take their business operations to the next level. One of Wade’s proudest efforts was crafting the joint venture between the Blackhawks and the Bulls to construct the United Center in Chicago. He also helped shepherd the new Minnesota LLC Act through to adoption in 2015. 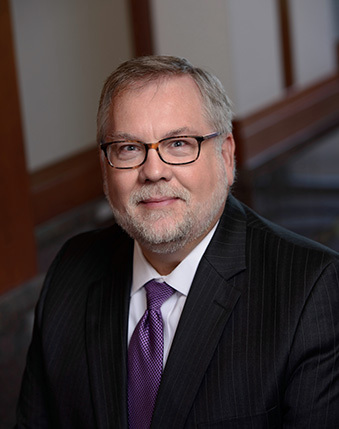 Wade leads Gislason & Hunter’s Estate Planning Practice Group and is active in several professional organizations including the MSBA Partnership/LLC Committee and the MSBA Business Law Section Council. He is a dedicated Blackhawks hockey and Twins baseball fan and serves in Lutheran church congregations and other community organizations. Led design and implementation of succession planning for third and fourth generation family owned holding company engaged in real estate, beverage distribution, banking and insurance industries. Represented multiple banks in branch acquisitions, capital transactions and bank holding company governance and regulatory matters. Represented major agricultural producers in farm estate and succession planning.